Featuring a sleek and aerodynamic design, it is easy-to-use and suitable for virtually all helmet types. This device is both waterproof and dustproof (IP67) proving a clear advantage when riding in difficult weather conditions. Superb sound is guaranteed thanks to the new 40mm ultra-thin HD stereo speakers and the battery life has been greatly improved, now lasting up to 13 hours before recharging. Equipped with 2 Bluetooth channels, you may connect each to a separate device, such as a mobile phone or GPS navigation system. A2DP music streaming is also available from a mobile phone or any other wireless music device. 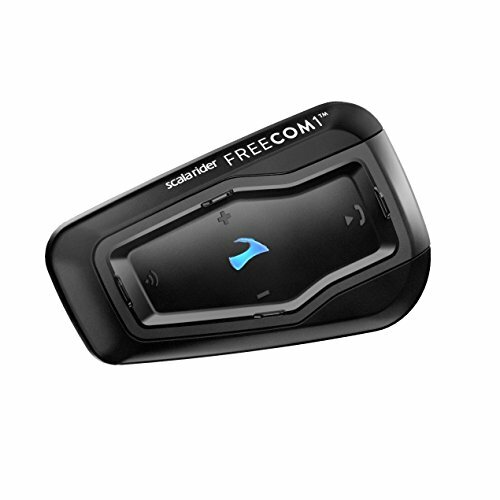 With AGC technology on board the volume of your FREECOM 1 automatically adjusts volume according to background noises and riding ambience. With safety in mind, voice activation technology (VOX) takes care of answering calls hands-free. The Cardo SmartSet App is compatible with both iOS and Android phones. The Cardo Community online platform offers users software upgrades and additional options for configuring your device settings from the comfort of home. If you have any questions about this product by Cardo, contact us by completing and submitting the form below. If you are looking for a specif part number, please include it with your message.